Today we put up the Christmas decorations in the house. The tree went up and I looked up and had no topper. So to Google I go, and lo and behold I found a video Tutorial by Shaby Fabric to make a 3D Folded Fabric snowflake. Here’s the link to the 3D Folded Fabric Snowflake. 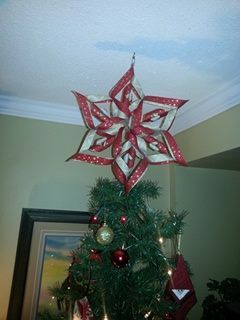 I choose to do mine in a red with gold leaf stars and an off white with gold leaf pattern. I cut mine to 6 inches. then the sub cuts were every 3/4″. After burning my fingers with the hot glue gun I was able to finish the snowflake. It is real easy to make but follow the cutting directions as the 1st block I did I cut along the wrong edge and had to make an other block. I guess I don’t remember it as well as I thought. So before I cut the 2nd block I re watched the video to see where I had gone wrong. It now resides at the top of my Christmas tree. I hung from a miniature cup hook screwed into the ceiling and a safety-pin in a point of the snowflake. I do believe this is a project that kids can do. just be sure an adult is using the glue gun so tiny fingers don’t get burned.